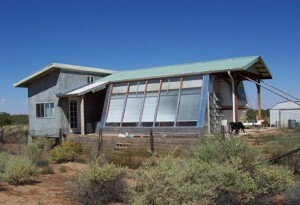 • Designed a passive solar house that captures solar heat during the day using thermal mass and releases it slowly overnight to warm the interior of the home. See Planet Thrive’s FREE read-only PDF brochure “Safer Construction Tips for the Environmentally Sensitive” for more on passive solar design principles. • Used Cadet SoftHeat Baseboard Heaters which are low EMF and have a powdered coating that has been well tolerated by those with both severe MCS and ES. Caution: The circulating fluid in the heater is 80% water and 20% ethylene glycol (antifreeze). This is the type of heat I currently have in the home I am renting here and two of the heaters have leaked while I’ve lived here and had to be replaced. • Installed electric hot water baseboard heating with the heat exchanger located at a distance from the home. • Installed in-floor radiant heating under concrete or ceramic tile with the heat exchanger located at a distance from the home. 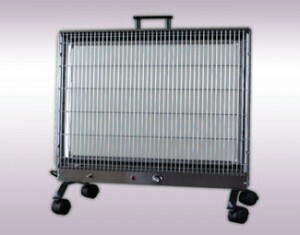 • Installed wall-mounted ceramic radiant heaters or used portable ceramic radiant heaters. Note: This portable ceramic radiant heater actually brought out my severe electrical sensitivity while I was living in a high-EMF home and I cannot tolerate this form of heat. But for those who can, it seems to be a very chemically safe (but expensive) option. These solid state ceramic heating units have been perfected over a period of years in working with the environmentally challenged, eliminating the hazards inherent in most other types of heat. No heat is as healthful and safe as radiant heat, which produces no chemicals, dust particles, odors, or fumes. A radiant heater will maintain optimal comfort in a room. The electromagnetic field emitted is well within the safe range. The ceramic-coated heating elements have a large emitting surface that is easily cleaned. All metal parts are washed in a baking soda solution before assembly. After assembly, the heaters are energized for three days before they are shipped. We offer a variety of models: stainless steel units for individuals with extreme sensitivities; units with powder coated finishes cured at 450º; and units with no painted parts. Sold through Radiant Electric Heat, Inc. (REH) located in Wisconsin and SSHC, Inc. (ENERJOY) in Connecticut. 1. Eat cooked root vegetables and other warming foods. Root vegetables like carrots, onion, turnips, parsnips, yams, and squash have a warming effect in the body. Other warming foods include whole grains, butter, spices like cayenne pepper and ginger, and beef. Avoid cooling foods such as uncooked vegetables, fruits and ice cream. 2. Drink warm liquids. Nourishing soups, teas, and glasses of hot water can help keep you warm from the inside out. Drink spiced tea if you can tolerate it, with a mix of warming spices such as cinnamon, ginger, cloves, peppercorn, and cardamom. My boyfriend does not tolerate the heating in his house, has few clothes, and is unable to drink tea, and so he warms himself all winter long by drinking lots of hot water, and warming his hands on the glass. 3. Stop shaving. Body hair helps keep us warm, just as an animal’s coat provides insulation from the cold. In winter months, letting leg and underarm hair grow out if you’re female, and facial hair if you’re a male, can help to conserve your body heat. 4. Keep extremities protected. A winter cap, gloves, a scarf, and socks or booties can go a long way to prevent heat loss from your body. 5. Rise with the sun — or with the moon. If you have warm enough clothing and bedding to sleep soundly through the night, try to adjust your sleep schedule so that you are up and about during daylight and asleep soon after dark, when temperatures drop. But if you are too cold to sleep through the night, you might try reversing your sleep schedule for the winter months, staying up and active at night and sleeping during the warmer daylight hours. 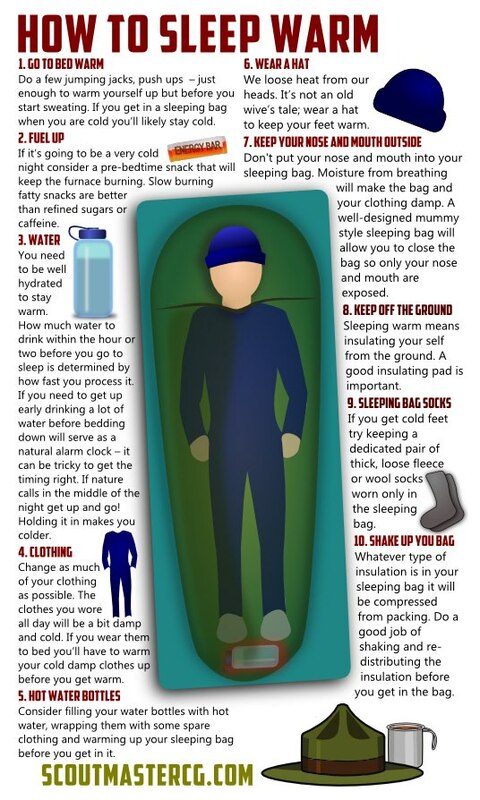 I got through last winter this way, sleeping in my car during the day when it was nice and toasty inside from the sun. 6. Keep the blinds open on southern windows during the day. The sun is the best source of heat for those with severe MCS and ES, unless you are sun sensitive, of course. Keep all window blinds on the south side of your home open during the day to maximize solar gain. 7. Seal window and door frames that leak cold air. Use weatherstripping, aluminum foil tape, and other tolerable materials to seal all cracks that let cold air seep into your home. 8. Take warm baths and showers. A hot shower or Epsom salt bath will warm you internally, as well as your house. It’s a daily ritual I always look forward to, no matter how cold it is out. 9. Keep moving. Sometimes the power will go off in the area where I live and it may take hours to go back on. Without heat or proper clothing to stay warm, I have to move my body to avoid the involuntary shivering that can sometimes wrack my body in lower temperatures. Dance, do jumping jacks, yoga, use your rebounder — whatever it takes to keep the blood flowing and your extremities warm. 10. Fill glass jugs with hot water. 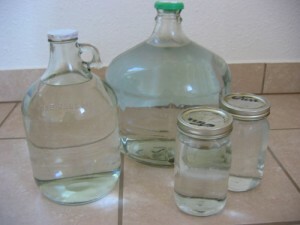 Recycle one-gallon glass jugs or purchase them new and fill them with hot water from the tap. It’s a great chem-/EMF-free way to stay warm while sleeping, working on the computer, reading, or watching TV. One of these on your lap and another under your feet will keep you nice and toasty. They are easy to refill over and over if they cool down. I have wrapped myself around 2 1/2 gallon jugs from Mountain Valley Spring Water at night, and used smaller quart Mason jars throughout the day, as well. They are breakable, so some care is needed — it’s no fun cleaning up shards of glass and 2 1/2 gallons of water at 3am! 11. Buy vintage hot water bottles. Try searching eBay for antique metal or stoneware hot water bottles—they’ll keep you warm through the night. Place in a hot water bottle cover so you don’t burn yourself and keep one on your tummy and one by your feet; or one at each side. Because they have had former owners, they will need to be cleaned well and may not be tolerated. Due to my metal sensitivity, I was never able to use the antique metal canteen I purchased, but the stoneware version kept me warm the winter I was without heat. 12. 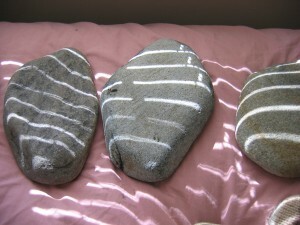 Use heated massage stones. A couple of years ago I was seeing a lymphatic drainage masseuse who used hot rocks on me regularly. Later that winter when I discovered I could not tolerate the heat in my apartment, I bought some for myself and would heat them religiously every night and place one under each foot, one on my stomach, and two under each shoulder near my neck — such a soothing way to fall asleep. They only stay warm for about an hour, depending on their size, but it was enough to help me drift off into a deep sleep, at least for a few hours. Warning: Handling boiling or very hot water can be dangerous. I sustained 2nd degree burns on my foot when boiling water splashed out of the pan I had my rocks in. Be careful! For more tips, see Heating and Cooling Options for the Environmentally Sensitive written by Andrew Eriksen on EIWellspring.org. I don’t have direct experience with these and so I did not include them in the article, but an MCS friend suggests using HeatMax packs (heatmax.com) which the website says are odorless, disposable, safe, nontoxic, nonflammable, environmentally friendly and contain all natural ingredients. They sound like a great tool to have on hand if the power goes out or to keep your hands warm while driving if you can’t use the heat in your car. I just don’t have personal experience with them so I can’t say if I found the packaging tolerable. I will probably order some for winter though. The same friend also recommended mylar blankets, which I do not tolerate but others might. Check to see if there is a slight oily residue on them, I have found that in the past. Wipe down with a tolerable cleaner, rinse and dry. There are lots of different sources online…here is one. Great article Julie! Very informative–I didn’t know about some of these options. I liked the one about growing our your body hair. I grew my beard 4 years ago when I was living outdoors in the winter, and it definitely helped! Glad you liked it Scott and Lene! Scott, so glad you shared that because that was the one tip I was wondering about…just how helpful it could be. Nice to hear it made a difference for you. I can’t imagine you lived outside in winter. Glad you are past that period in your life! This is our first winter in our new place and I have found my favorite place right now is on the floor w/ my back on the wall resting it just above the Cadet SoftHeat Baseboard Heater. It actually feels really safe and healing – I actually took a nap the other day pressed up against it and woke up the better for it. Now the wall heaters w/ the fan that are in the other rooms I’m finding a challenge some days – like they change the charge in the air or something weird like that. It’s really a blessing, Julie, to have you in the community! You’ve gone through so much struggle, and thus have so much wisdom to impart- THANK YOU!!!! Thanks for the great post for heating options. The temps have been in the teens here in the NW and gratefully, the Radiant Electric Heater is doing the job of keeping our vardo toasty. The hot water bottles is a thing we’ll try. Hot stones really are wonderful too. I have a special heart-shaped stone that I heat up (in water over low heat). It seems to ground me as well as warm me when my body has been chilled, exposed and frittered away. I replaced my gas stove with an electric one last year. My house is still a gas heat, gas hot water house. I have an AllerAir purifier next to the gas burner and it is also vented to the outside. The vent is next to the burner. I have never smelled gas in the cellar. I wear a charcoal mask when I go there. Sometimes we have to make the best of a not perfect situation and it sounds like you are taking all the right precautions Bettybetts. Thanks for sharing the steps you have taken. I just ordered the HeatMax hand warmers…will report back how well I tolerate them. Excited!! Thanks for the article. Well written and easy to read. Lots of helpful information. Just realized I never reported back about the HeatMax hand warmers. I TOTALLY TOLERATE THEM! Yahoo! What a blessing. I could sleep with them in my hands. The only issue…is the batch I got does not get that warm. Total bummer. But a little warmth is better than no warmth. I’m just so excited that I tolerate them. Luckily the power only went out once this winter so I didn’t need to rely on them for heat. It’s nice to know I can use them if I need to, though. i make bags [flannel is my favorite] and fill them with corn [not popcorn-it will pop] or cherry pits. warm them the same way you do the stones. i make long ones to drape over my shoulders or wrap around your feet. to keep the corn from shifting, i fill a pocket, sew it shut, fill a pocket, sew until the end and sew the end closed. each pocket is 2-4 inches square. natural rubber hotwater bottles can be great. store hot water in thermoses and drink lots of tea. do not hold your urine, your body loses heat trying to keep it warm. snuggle! Just a note about the HeatMax hand warmers…I discovered this winter that if you put them in your hoody pocket they get really hot. Which is a good thing if yours don’t heat up well like the batch I got. But also, be careful because it can really get very hot and might burn you. I wouldn’t keep it enclosed in a pocket for too long without checking on it from time to time. Put radiant floor heating under your bathroom floors! Wonderful post, Julie! I’m sure it will help many people. Just thought I’d add more info on the electric baseboard heat option. It’s less ideal than the cadet radiant board heat, but this version is often tolerated well, and like the Cadet system, must also be installed by an electrician: Hydrosil electric baseboard heater – 1-800-627-9276. http://www.hydrosil.com/ Choose only the silicon version. Important note from our team EMF specialist/electrician on installing baseboard heat as listed above: Electric baseboard heaters will not emit AC electric fields (vs. AC magnetic fields) if they are hard wired with MC or Flex conduit. In addition, if they are adjusted for 240 volts the current is much lower and magnetic fields will be minimized. That’s the best arrangement. Still, the individual units, particularly if they are electric baseboard vs. the first better hydronic version, need a couple of feet to be clear of AC magnetic fields in the living space. But if the circuitry to the units is installed well, EMF exposure problems are minimal. The branch circuit wiring in the house that serves each electric baseboard heater needs to be wired in flex or MC (metal clad cable). The units themselves do not need rewiring for shielding, and usually come with optional hook-up terminals for 120 volt power or 240 volt power. Its the electricians job to make sure the premises (house) wiring is correct for the heaters and install them appropriately. Thanks for the info! I am looking for a stink-free space heater for the home. All of them from hardware stores smell of chemicals and are disgusting. Thanks so much! Thank you for putting this out there.. I have 1 more winter to survive before we move to a healthier place!! Nice not to feel so alone with this devastating illness! 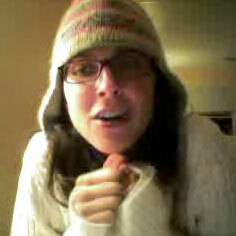 In a pinch, I madly crocheted a muff for my hands, and, a hat out of yarn to survive a freak freeze in the south in June. I shopped for yarn with the highest wool content I could find. I crochet faster than I knit, so I did that. It took me 3 hours, but it was well worth it and I used them for years. Knitted fibers wear better over time than crocheted fibers because they’re not bent as much during making and wearing, but that may not be a concern. It isn’t for me. Since I don’t tolerate non-organic lanolin well, I would have to wash yarn before crocheting with it, if it’s been spun “in-the-grease”. Even if I could tolerate them, synthetic fibers collect moisture and don’t insulate well. However, if you’re desperate and require synthetic yarn, buy the fuzziest, most fur-like yarn possible and crochet/knit with that. If you can get real fur, you can wear it or wrap it around yourself the same way, like the Eskimo do. Additional benefit: Doing handwork like crochet or knitting can pay off in many ways, including stress relief and money. Indigenous housing is a good thing to know how to make, if you’re MCS. I watched videos on how Sami and Eskimo live in their shelters. I learned how to make Tipis and Gers. As an offshoot of the heat issue, yet crucial in staying warm, I learned how to eat paleo and how to preserve food using drying methods and probiotics in different weather conditions. Food is a vital yet hard thing to deal with in different weather conditions. If you have trouble getting to water, that’s an issue, as well. Thank you Bron! I loved all you shared! Such helpful info. My bestfriend this winter are massage stones. it really helped me a lot on beating the coldness!